Built as a passenger-cargo vessel under yard No 266 by Caird & Co, Greenock for the Peninsular & Oriental Steam Navigation Company, London. 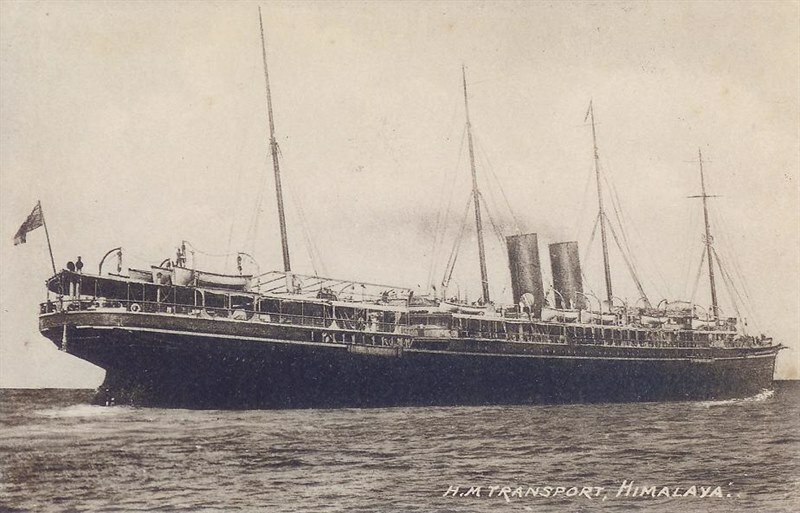 27 February 1892 launched as the HIMALAYA. Tonnage 6,898 gross, 3,597 net, dim. 141.91 (bpp) x 15.91 x 8.05m. Powered by two 3-cyl. triple expansion steam engine, manufactured by shipbuilder, 5,600 ihp, twin shaft, speed 18 knots. Accommodation for 265 first and 144 second class passengers. 24 June 1892 trials and the same day delivered to owners. Her maiden voyage was from London to Colombo, Melbourne and Sydney. 09 October 1908 was her last sailing in this service. Employed on patrol duties in the China Sea. 21 June 1916 Sold to the British Admiralty and fitted out with 6 inch guns, and an aircraft deck and a Short 827 seaplane at Simonstown, South Africa. In service on convoy duties on the East Coast of Africa until the end of the war, was based at Zanzibar. 28 June till 04 July 1916 at sea off Lindi River, East Africa. 28 and 29 June 1916 opened fire on four dhows in a creek at Gingwea, which were hit. In this period she used regular her seaplane for reconnaissance flights. 1919 Was she used as a troopship. 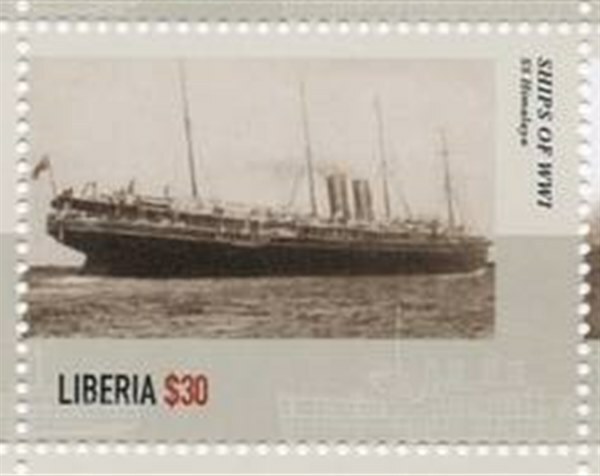 June 1919 resold to the P&O. March 1922 sold to the Board of Trade in London. April 1922 sold via Stelp & Leighton Ltd., London to Germany for demolition. 11 May 1922 arrived at Bremen for breaking up. Liberia 1915 $30 sg?, scott 3093 o.